Students attend pre-concert class and performance of the Stony Brook Symphony Orchestra. Mastic Beach, NY - October 10th, 2013 - William Floyd High School orchestra students recently participated in a special orchestra class led by Michael Hershkowitz, the director of concerts and community music programs in the Department of Music at Stony Brook University. Mr. Hershkowitz’s visit, which served as a pre-concert lecture for students who attended a performance of the Stony Brook Symphony Orchestra, detailed the discussion on the cultural connection between music and literature and how music is historically connected to education. During the class, Mr. Hershkowitz spoke about the proper structure of an orchestra concert and answered a variety of questions ranging from what it takes to be a college and professional musician, whether Stony Brook offers scholarships for orchestra students and more. Students also asked him about his highlights as a musician for which he referenced an orchestra tour through China and playing in a marching band at a professional football stadium. Then, on Saturday, October 5, more than 50 William Floyd High School orchestra students attended the Stony Brook Symphony Orchestra’s evening performance, complete with bus transportation to and from the university provided by Stony Brook. “There is nothing like being there for a live performance,” said William Floyd High School orchestra teacher Amy Sckipp, who attended with fellow orchestra teacher Christopher Shaughnessy and their students. “It really was a wonderfully enriching experience and I believe it inspired many of our students to know that they can continue their passion beyond high school.” William Floyd students have been invited back next month to see a performance of the world-famous violinist Midori. Orchestra class: William Floyd High School orchestra students with teachers Amy Sckipp and Christopher Shaughnessy (far left); Michael Hershkowitz, director of concerts and community music programs, Stony Brook University (center); and Paul Newland, outreach coordinator, Staller Center for the Arts, Stony Brook University (far right). 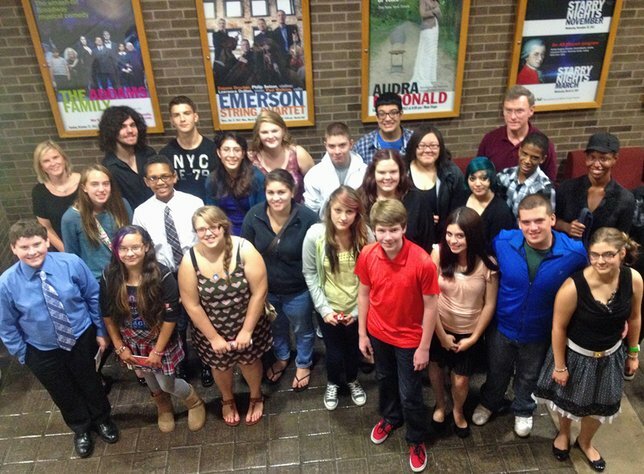 Subject: LongIsland.com - Your Name sent you Article details of "William Floyd High School’s Night At The Symphony"